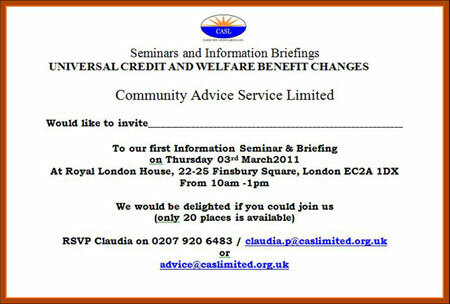 On 3rd of March 2011 Community Advice Service Limited (CASL) held a seminar and briefing event in their Moorgate office to update and train their corporate clients on the coalition government's proposed Universal Credit, important developments in possession proceedings and other issues affecting social landlords and their tenants. Amongst those who attended were Caroline Oliver from Redbridge Homes; Jackie Fearon of Estuary Homes; Peter Mair from Notting Hill Housing Group, Howard Dawson of Thames Valley Homes and Amanda Ball of One Housing Group. Branislav Djogo, CASL's Development Director, conducted the proceedings in his usual ebullient form. Stuart Freeman, who is pre-eminent in the advice industry and currently acts as a Principal Consultant for CASL, delivered a detailed and insightful briefing on Universal Credit and the comprehensive changes to Welfare Benefits and all the possible implications for social landlords. Clive Nnamdi-Johnson, CASL's Director of Operations took the guests through recent developments in possession proceedings, particularly the need for social landlords to weigh their tenants' personal circumstances and to be mindful of the proportionality of bringing possession action against them. He also talked about the issues surrounding under-occupancy. Alistair Murray, the Assistant Director of Housing Justice delivered a very enthralling insight into the role of Churches in tackling homelessness and their efforts to provide social housing. A lively question and answer session followed each speaker's delivery and the feedback afterwards unanimously declared the event a resounding success.